"Little Babe", "Big Jennie" and "Tessie" were with the Cole Show the entire time (1935-50). Seen here with John Herriott on the back lot of MGM Studios in 1954 while filming "Jupiter's Darling". Interesting moose tales. I'll take Pat White's word about a moose on Carson & Barnes Circus. What I recall about moose is that they seem to be difficult to care for. There was a young moose at Lincoln Park Zoo around 1961 but wasn't around for long. The Milwaukee Zoo was known for their moose herd. They were supplied with browse from the Park Dept. and they would also be fed banana peels (substitute for aquatic plants). The Columbus Zoo has had a pair moose for several years. Maybe they can be trained but first can they be maintained? Do Ray Pawley and Mark know anymore about the LPZ moose. Ken Kawata can help about the Milwaukee herd and more. Are you certain that you haven't been spoofed? 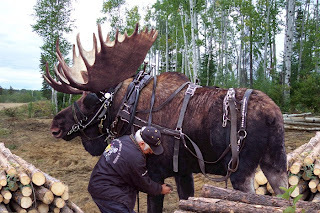 I imagine that anything is possible, but it sure looks to me like someone skillfully merged horse harness with a photo of a moose and created some "up nort" humor. The picture of the moose has the appearance of being skillfully manipulated. One cannot see any shadows anywhere, the meeting of the fur and the harness is totally clean, with no overhanging hair, etc. It's exactly the sort of image that causes one to question it. I also searched on line for Jacques's address and he's not listed. That's not conclusive, he might just not have a phone in the woods. I don't doubt the intelligence of the animal or the ability to be trained, but the picture just looks suspicious in the manner in which it is arranged. I guess some inquiry could be made of the Maine Forestry Service or its Wildlife Department. 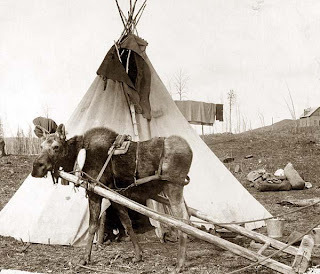 We had been trying to keep this under wraps as we knew this would happen once folks found out that with some effort you can train moose to harness. Once this picture got out, it's been E-mailed around like crazy but no one has bothered to fill in the rest of the story so before any rampant rumors get going, I better write down what I know. I folks want to extrapolate on that, then Lord only knows where this picture and story will end up. ?????? ? The man in the picture is Jacques Leroux who lives up near Escourt Station and has always had work horses, first for actual work and then for show at Maine's' many summer fairs. ? ? I think he had two matched pairs, one Clydesdales and the other Belgiums. He would turn them out to pasture each morning and then work them in the afternoon dragging the sled around the fields. ? ? Three springs ago, he noticed a female moose coming to the pasture and helping herself of the hay and what grain the work horses didn't pick up off the ground. Jacques said he could get within 10 feet of the moose before it would turn and move off. ? ? Two springs ago, the moose foaled(? )at the edge of the work horse pasture and upon getting to it's? feet had not only the mother in attendance but the four horses. The young moose grew up around the horses and each afternoon when Mr. Leroux took the teams for their daily exercise the yearling moose would trail along the entire route next to the near horse. ? ? At some point, the yearling got so accustomed to Mr. Leroux that, after he had brushed each horse after a workout, he started brushing down the moose. The moose tolerated this quite well so Mr. Leroux started draping harness parts over the yearling to see how he would tolerate these objects. The yearling was soon harness broken and now came the question of what could you do with a harness broke moose. ? ? As you may or may not know, a great deal of Maine is being bought up by folks "from away" and some of them understand principles of forest management. Well the folks buying small parcels of land up in the area of the Allagash have it in their mind that they don't want big skidders and processors and forwarders on their small wood lots. Enter Mr. Leroux with his teams of horses. ? ? Every morning, when Mr.. Leroux loaded the teams into the horse trailer to go off to the days job, the yearling moose got quite riled up and one day loaded himself right into the trailer with the horses. At the job site, Jacques unloaded the horses and as the moose stayed right with them, he would take the Clydesdales and his brother Gaston would take the Belgians and off into the woods they would go with the moose trailing behind. They would put the harness on the moose in case they encountered someone who they could kid with the explanation that the moose was a spare in case something happened to one of the horses. The work required them to skid cut, limbed and topped stems to the landing where the stems could be loaded onto a truck for the pulp mill. ? ? All morning long the two brothers brought out twitch after twitch of stems with the moose following the Belgian team for the most part. At lunch break Jacques had the bright idea of putting trace chains and a whiffle tree on the moose's harness and all afternoon the moose went back and forth following the Belgians in and out of the woods dragging his whiffletree along the ground. As there were no stumps in the skid trail, the whiffle tree never hung up on anything and that first day in harness went great. So next day, they hitched on first a small stem and the moose brought it out just fine following the Belgians. ? ? Mr. Leroux told me they were up to four small stems now and the moose was doing just great. He cautioned however that there were a few problems with using a bull moose. Come June, when the new antlers start, the new bone is "in velvet" and must itch like crazy as the moose stops every once in awhile and rubs his rack against just about anything to appease the itch. Once, before the brothers learned to tie him of by himself while they had lunch, moose was rubbing his antlers against the hame on the Clydesdale called Jack and got it wedged there for a bit. Jacques said he wished he had a camera as it looked like moose was trying to push Jack over. ????? ? The other problem is the rutting season. The brothers learned quickly to leave moose in the barn as he was constantly on red alert in the woods during this time. The brothers are also considering trying this with two females to make a matched pair which would become an instant hit at the Maine Fairs. The trouble with the bulls is their racks. They would be constantly rubbing and hitting each other and yes they would have to be gelded as I just couldn't imagine getting the two bulls anywhere near each other, let alone in harness. ? ? So now that this picture is going all over the place, the surprise has been let out of the proverbial bag. The Lerouxs want to continue the work of trying to get a pair of females in harness but they may have to end up breeding moose to do this and that's where they will run into trouble with the State of Maine IF & W. I'm sure they don't like the idea of the brothers "keeping" wild animals. ? ? Thought you should know the rest of the story. If any of you doubt this please contact Tom Whitworth in Ashland ,Maine. I think he said was a second cousin to the Lerouxs and has seen this anomaly many times. ? ? Regards from your frozen Northeasterly?state. What's good for Peter the Great at Bronx zoo is good for Buckles. And welcome to the 72nders Club. I can attest that life is still good at three score and a dozen. "The reason for the late entry is because if the item comes without a "paper clip" I sometimes have to wait until Shannon is available." This is the actual 1947 photo that inspired that gag birthday card. Pete was an icon at the Bronx zoo. He had a huge outside yard in the NE corner of the old and beautiful 1909 Elephant House (where this photo was taken) . But it did not have a bathing pool. He had one inside but he had to get by sans water while in the yard. He was the Bronx's only hippo throughout his life there. He died on Feb. 1, 1953. Beloved Hamid-Morton Circus Executive and long time director of the Texas Shrine Circuses..................Bob Atterbury. "Trenton, Nebraska July 6, 1946. Zingaro's novelty truck (panel) in foreground. Truck at right had light plant in rear end and also loaded the horses and ponies." The remarks in quotations are from the back of each picture and I'm sure came from my father's good friend Joe Fleming. I am assuming that the show was still owned by the Atterbury family. The marquee is half the size of the big top which is about a 60 with two 20's. "Big Top canvas and poles." For as long as I can remember, the compartment beneath the truck was called a "possum belly". Now you see them everywhere, in fact my bus has at least six on each on each side and damn things jam constantly. I might have them modified to a hasp and a bent nail so they will work efficiently as seen above. "Stake driver. Calliope behind cab under tarp." This looks like the same stake driver as the previous year but now mouinted on a truck." "Canvas & poles in this semi." "Ring curb, seats and props."